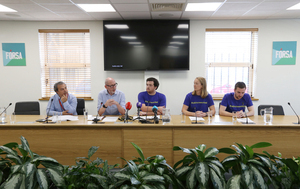 Above from left: Gabrial Mocho Rodriguez, International Transport Federation (ITF); Oliver Richardson, ITF; Eoin Coates, ITF; Charlotte Hall, ITF; and Kevin Donoghue, Forsa, at a press conference at the Ryanair Cabin Crews Summit Dublin in Forsa’s office at Nerney’s Court, Dublin, today. Forsa Trade Union, Nerney’s Court, Duiblin 1. Further to the announcement of one-day strike action by Ryanair pilots…. Ryanair cabin crew representatives have published a charter of demands for better pay and conditions, including the abolition of agency employment, and the removal of sales commission as a basis for promotions. The representatives from across Europe have spent the last two days compiling the charter of demands under eight headings: economic conditions, safety and rostering, a fair and supportive work culture, agency employment, national contracts, sickness, sales and ground staff. 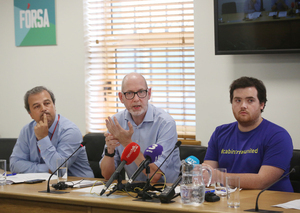 They have warned that if their demands are not met, Ryanair risks a summer of industrial action – but have no plans at present to ballot members for strike action in the 21 countries where they operate…. Posted in Misc and tagged Cabin Crew, Ryanair at 1:26 pm on July 4, 2018 by Bodger. lively audience in the second picture. no it’s a Sideshow Bob convention. they just died the hair green because they were in Ireland. The Pay of the Triffids ! I don’t know, I really dont! Ryanair Manager : “here’s the job on offer, do you accept? Like i’m sorry you knew the conditions before you accepted, there’s no health a safety issues, there’s no breaking of employment laws! You just want it a bit better! Dont we all but you can always quit and get a different job you know. Fuppin twinkle toes generation and its becoming infectious. I cant wait to see them crying off with their P45s cause people stop booking and there’s no work for them at all. Fair play is fair sport. These are not the great afflicted and left behind workers with Chinese working hours and conditions. These people get paid well. You dont like it well boohoo. Move. Accepting a job does not mean you give up the right to ask for better pay or conditions without fear of negative consequences. Good, because it was a load of bolish, worlds crappiest ranter. Knocking for the sake of knocking is just wanting to be heard. Like what are you? Eight! …. or worse still, a Ryanair worker who has to so some work. The company is it’s workers. If the board and executives die tomorrow, Ryanair flies. If the staff walk out, it doesn’t. I’m delighted workers are rediscovering their power. Maybe luxury things like secure pension provision and wage growth keeping up with prices aren’t things of a gilded past era after all. This is nonsense though. Have you seen what their complaints are? Collective bargaining is one thing but holding a company to ransom is another. These are not slaves. These people are not working in conditions that hark back to a time when the lord of the manor ruled the roost. These are well paid decent jobs for a largely lower end educated workforce with little or no qualifications what so ever. They’ve got to get real. Want a better job then educate yourself to a higher level. Guess what, there’s plenty of demand for highly qualified people everywhere. Like to turn your “If the board and executives die tomorrow, Ryanair flies” comment on its head you could say the majority of Ryanair’s work force can be trained during coffee break. For the tail to be wagging the dog is hilarious. Unions are a pariah. They’d kill the goose that lays the golden egg rather than back down. If they get a real hold of this it’ll be disastrous. I really hope Ryanair has the time and the resolve to tackle this unionised heist and see it off. This is a bit trite; General Motors laid off all its workers in Detroit, and hired new ones in Mexico, and it was still General Motors. So workers are lazy criminal slackers and disposable. Unionise folks, because they really despise you! All power to the workers, keep sticking it to the exploiters..
Support also to the workers of Irish Archaeological Consultancy who started their picket today with Unite at the Macroom By-pass. I believe the press conference is taking place in Papau New Guinea. “The spectacular headresses in the audience of rapt attendees is traditional adornment of young social media influencers of the Huli Wigmen tribe.” according to Binky O’Mara who was there once with the yacht club. all wealth is created by labor. This is even sillier than ‘the company is it’s workers’ – aeroplanes cost a lot of money, and there would be no airline without aeroplanes. Most enterprises require both capital and labour. there would be no aeroplanes withour the workers who build them.